messages on your mobile device. convenient for you: e-mail, SMS, Skype, Jabber or ICQ! In this manual, all the screenshots are made using iPhone. The operating principle of the application for Android is exactly the same as for iPhone. 1. What is the application used for? 2. Why do I need PGP keys? 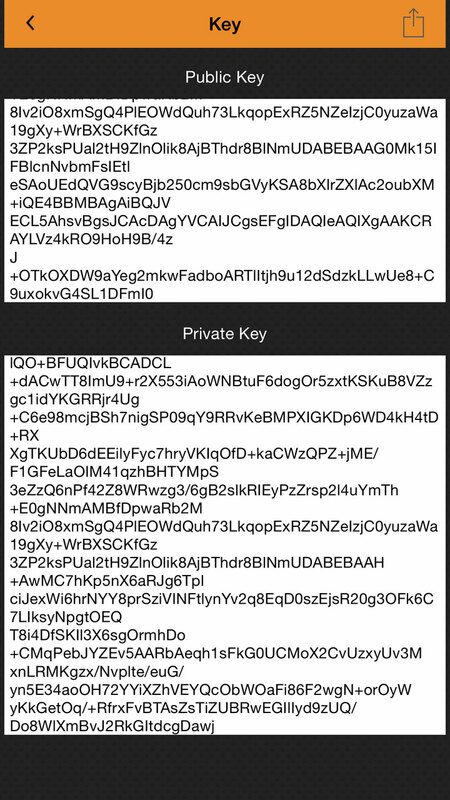 PGP keys are used to encrypt messages. Without PGP key pair the algorithm by which the whole encryption system runs will not work. We recommend using at least 2048-byte encryption keys. Depending on the type of their activity, almost everyone comes across encryption. It's no secret that in today's world, a great mass of information falls into the hands of 3rd persons to whom this information should not be available. 4. How to create a key pair? With the help of PGPTools you can create a new key pair without exiting the application. Please note that you can generate new keys for each message. Working with keys is easy if you label them with designations cognizable to you (Example: your partner John’s e-mail is [email protected] – name the key with this e-mail address and you will know for sure that this key is used for this contact). 5. How to import a PGP keys pair? Our application has import function for key pairs. To import your keys, click Import in the PGPKeys menu. After that, insert your key into the field in a way convenient for you. 6. How to exchange keys with your conversation partner or other user? Select your key from the general list of keys and simply click on it. You will automatically get a window with more detailed information and your key pair (Figure 1.). In this window you can either copy the key to clipboard and send it by e-mail or do it any other way. By clicking the top icon, you can send your key by e-mail in one click. 7. How to assign keys to your conversation partner or other user? Go to "Key List" section. Select "Import" in the upper right corner. Enter User name, which would identify the key for message encryption. Insert the public key (Public Key) of your conversation partner in the field below. Your partner’s key will appear in the list, which can be used to encrypt text messages. 8. How to encrypt e-mail, message or letter? To encrypt a message, you will need a Public key of the user whom you want to contact. This is easily done by selecting it from the list of keys in the upper left corner ("Select Key"). Once you have chosen your partner’s public key click "Convert" (Fig. 2.) An encrypted message will appear in the field! Pass this message to your conversation partner for decryption. 9. How to decrypt e-mail or message? To decrypt a message, simply insert your message into the upper block and select message decryption mode in the center of the screen "PGPMessage <> Message". After pressing, the button will change its status to "Message <> PGPMessage". 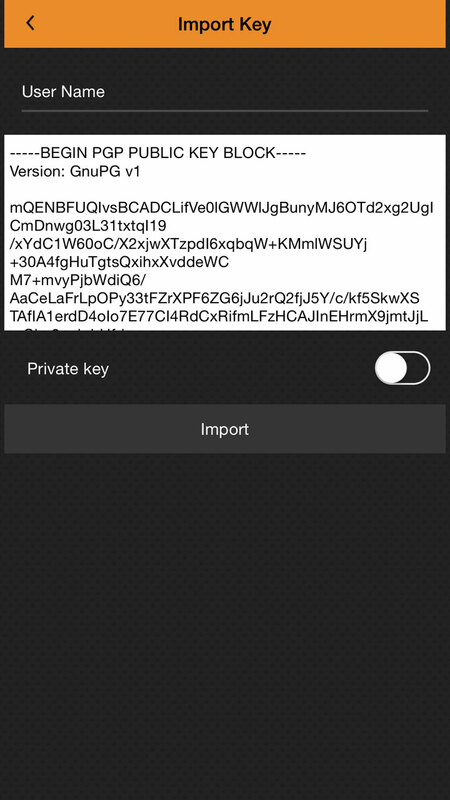 Now you can select a key to decrypt the message from the list "Select Key". Do not forget that unless you saved your password, the key may ask you to enter it. This can be done at the very bottom in the "Password" field. 10. How to encrypt SMS or Skype message? With our app you can send an encrypted message the way convenient for you. You can encrypt text using PGPTools the same way you encrypt e-mail messages, and send them not just by mail, but also via Skype, Jabber, ICQ or SMS. 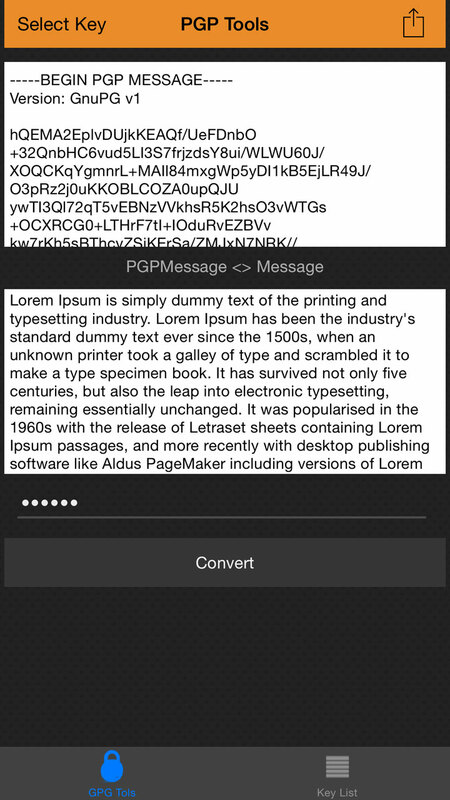 To do this, simply copy the encrypted text from the PGPTools application, paste the text into SMS and send it to the recipient. The recipient will copy this message, insert it into our application and decrypt the text you sent.